ANDERSON—Attendees at the inaugural Texas Baptists Institutional Legacy Day on Sunday, Jan. 27, witnessed a celebration of faith and providence when Executive Director David Hardage recognized the University of Mary Hardin-Baylor (UMHB) for 174 years of service in Christian higher education. The award recognition occurred during a worship service at the historic Anderson Baptist Church in Anderson, 30 miles southeast of College Station. Founded in 1845 as the first Baptist university in Texas, UMHB and its counterpart Baylor University are the oldest institutions in partnership with the Baptist General Convention of Texas. In 1886, Baylor Female College (later renamed the University of Mary Hardin-Baylor) moved to Belton, where it is presently located. In a day and time when many women could not attend college, UMHB was a pathway to receive an education. The university was home to the first Baptist Student Union group in the state in 1920, and in 1934 on the brink of closure, John and Mary Hardin gave a gift to save the institution. Another significant milestone was in 1972 when the university became co-educational. Today, UMHB enjoys enrollment of approximately 3,900 students and employs more than 400 full-time faculty and staff who are committed to the values of Christian higher education. “It’s such a great honor to be here. 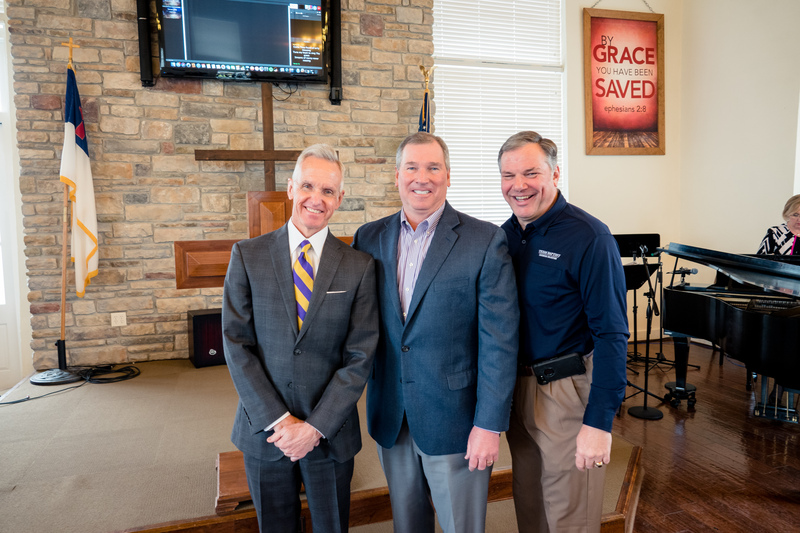 We are proud of our partnership with the Baptist General Convention of Texas,” said Randy O’Rear, UMHB president. In addition to the recognition, Dr. John Vassar, UMHB provost, delivered a sermon from Psalm 78:1-7 in which he reminded congregants that anytime we celebrate our story, we are celebrating God’s story. The command to us, Vassar said, is that we tell others what God has done in our lives, not as a story about us, but as a story about God. Institutional Legacy Day began as a way for Texas Baptists to honor the legacy of institutions, in order of their formation, that have partnered with or grown through cooperation with Texas Baptists. After more than 133 years of ministry, the Convention now partners with more than 27 education, health, and human care institutions. Anderson Baptist Church holds significance in Texas Baptists history as the location where, in 1886, five state conventions merged to form the Baptist General Convention of Texas in order to more effectively advance the Kingdom of God. Each year on the last Sunday in January, Texas Baptists will honor a partnering institution in order of their founding. Baylor University, also founded in 1845, will be recognized in 2020. Additionally, Institutional Legacy Day follows in the footsteps of Texas Baptists Legacy Day, which has been held annually in historic Independence, TX, on the first Sunday in June since 2013. In that recognition, two individuals are recognized for their contribution to Texas Baptists life. In addition to the recognition, Anderson Baptist Church’s Pastor Kyle Childress presented historical church documents to Alan Lefever, director of the Texas Baptist Historical Collection.